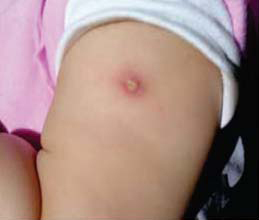 BCG is a vaccine against tuberculosis (TB). It uses a live TB germ that has been modified in the laboratory so that it will not cause disease in a healthy person. The BCG vaccination is not part of the WA routine vaccination program it is only given in restricted circumstances. It is injected between the layers of skin on the upper arm near the shoulder by a Registered Nurse who has been trained in providing the vaccination. In most circumstances the vaccine is safe. As with any vaccination, BCG can result in severe adverse reactions and you should discuss this with the nurse before vaccination. BCG vaccination reduces the risk of tuberculosis in people who are not already infected with TB. The vaccine does not always prevent disease. It is more effective in children < 6yrs old, providing 50 to 80 % protection against meningeal and miliary TB. Protection against TB will only start 6-8 weeks after the vaccination has been given and lasts for about 10 years. Will be making repeated visits to a country with a high incidence of tuberculosis that is likely to be for a cumulative period of more than 3 months. For country specific incidence rates see the World Health Organisation TB country profile website (external site). Newborn children of migrants who have arrived from countries with a high incidence of tuberculosis (see definition above) in the last 5 years, or newborn children who have household contact with people who have arrived from a high incidence country in the last 5 years. Newborn children of parents with Leprosy or a family history of Leprosy. Children less than 6 years old who have not previously been vaccinated with BCG and are household contacts of newly diagnosed Leprosy case. Who should not be vaccinated with BCG 10 Anti-Tuberculosis Vaccine? Infants with a body mass below 2,000g. Persons who have had a tuberculin skin test (TST) reaction. Persons who have TB disease now, or have had TB disease in the past. Persons with HIV infection; including newborn children of mothers infected with HIV until this infection is ruled out in the child. Newborn children of mothers treated in their third trimester with medications such as anti-TNF-alpha monoclonal antibodies. Persons who have had a serious illness such as kidney disease. People with known hypersensitivity to any component of the vaccine. When should BCG vaccination be delayed? Leave the sore alone and ensure it remains exposed to the air. This helps it to heal quickly. The child’s arm where the BCG vaccine has been administered should not be used for at least 3 months after the BCG vaccination for any other vaccines. If you have any questions please telephone the WA TB Control Program at the Anita Clayton Centre between 8.15am and 4.15pm Monday to Friday on 9222 8500 to talk to a Registered Nurse.